Ceramics, specifically hand-building with clay, is another interest. I started potting in April 2009, attending an afternoon or evening class one day a week, up until April 2012 (by which point, I'd run out of space to put these things!). This is a catalogue of some of my better pieces. They are arranged approximately in chronological order, my newest pieces first. In a way, pottery and birding go very well together. You are constantly connected to the natural world. I am either treading the earth, enjoying the sight and sound of bird life, or I am kneading the earth, forming shapes and textures which, with a lot of luck, might also be aesthetically pleasing! Where helpful, I've inserted one or more views of a piece within its main image. Red terracotta clay (earthenware). 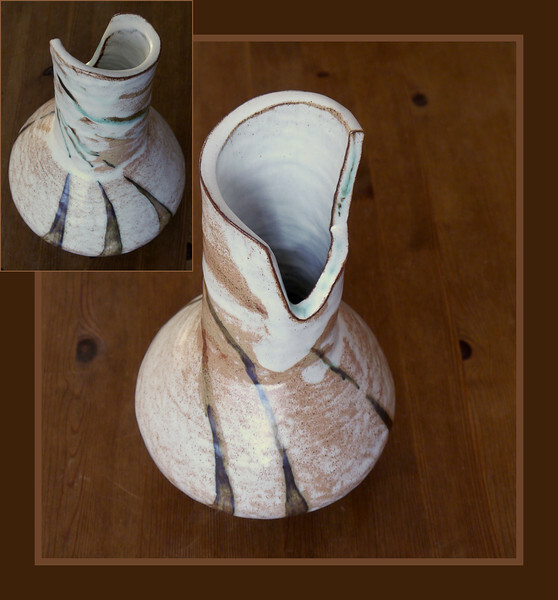 Hand-built using the coiling technique (approx height 30cm). Having made this during Summer 2011, I finally got around to decorating/glazing it Winter 2012. I painted on the lines/swirls using copper oxide then dip glazed the whole pot in Vellum white.